Description: Leading a northbound train across Hunsaker Road north of Marion. Description: Leading a northbound manifest north of Marion. Description: UP 5333 is second unit of four unit eastbound (>) UP freight on siding at Huntington Yard awaiting westbound traffic before proceeding. 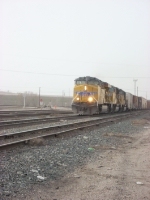 Description: One of three AC45CCTE on point of eastbound freight at speed. UP Huntington Sub. Description: Salad Bowl exspress rolls through Blair,Nebraska. Description: Q390 eastbound with UP power. Title: UP 5333 & Co. Description: It highballed not too long after this was taken. Just the Stanford and the Sunset. Description: A fading UP gevo. Description: DPU on "The Bird". 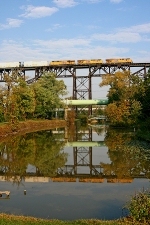 Description: A welded rail train heads east. Description: UP's QDYNL-24(QUality Manifest Dayton, TX-North Little Rock, AR) waits on the New East Connection as the UPQFP-24(Unit Train Plaquemine, La) waits for an outbound crew. 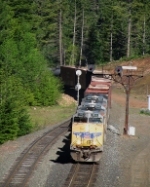 Description: Westbound UP freight. UP Huntington Sub.